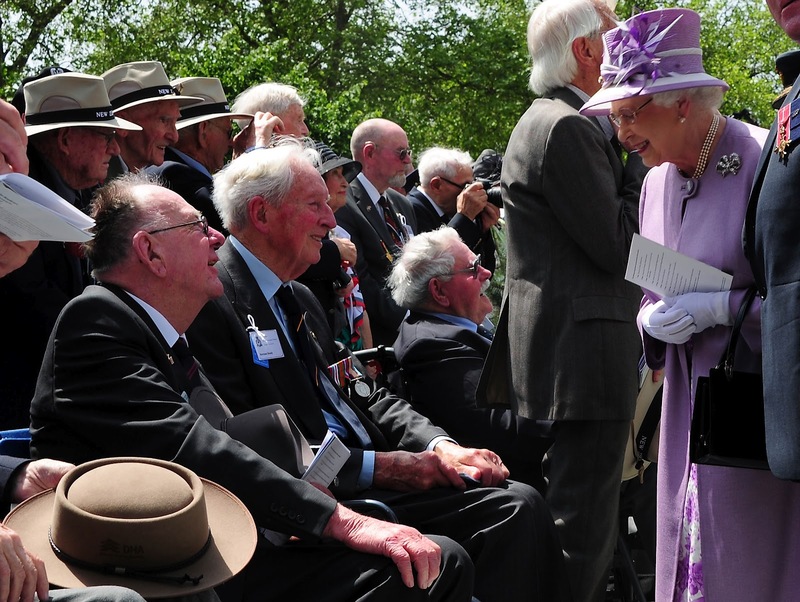 Her Majesty the Queen thanks Australian Bomber Command veterans David Leicester and Norman Deady for their service at the Bomber Command Memorial dedication in London. Second World War veterans from Britain, Australia, Canada and around the world braved sweltering conditions on 28th June 2012 to see the Queen unveil a memorial to tens of thousands of airmen who died in the conflict. 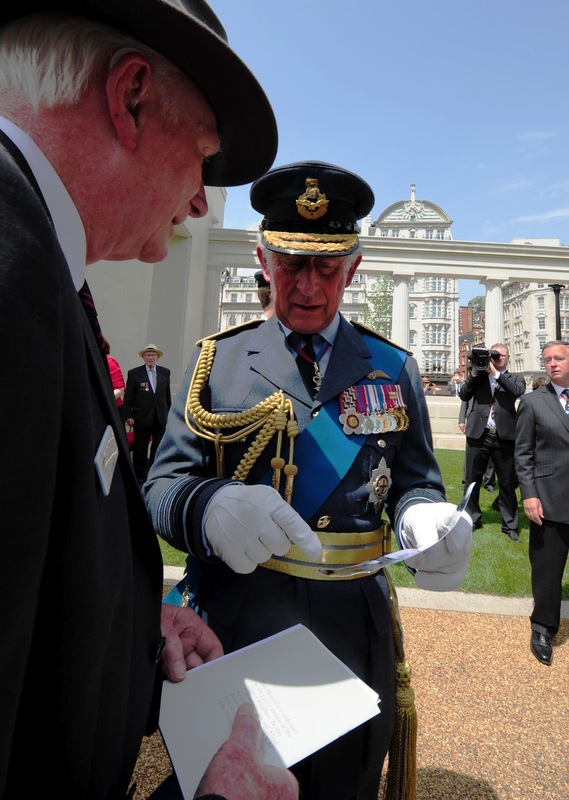 The Bomber Command Memorial in London's Green Park remembers the sacrifice and bravery of the RAF and Commonwealth crew who played a crucial part in winning the War and faced death on a daily basis. Marshal of the Royal Air Force HRH The Prince of Wales shakes hands with Australian Bomber Command Veterans at the memorial dedication. 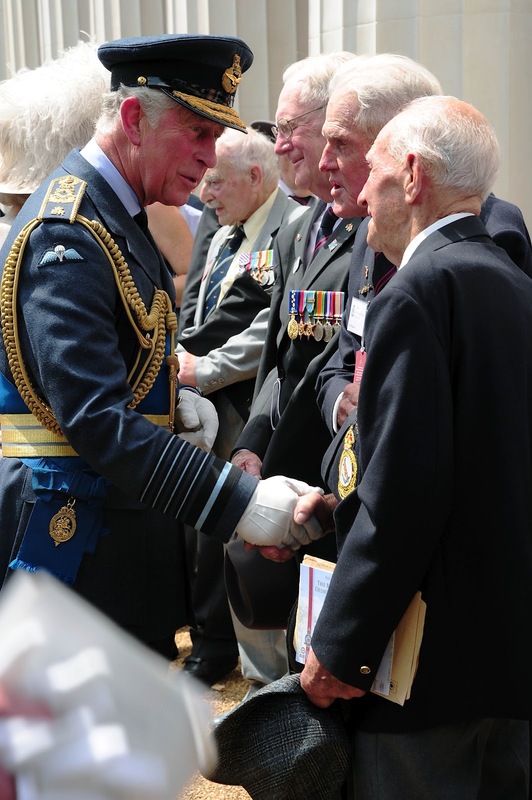 More than 5,000 veterans and veterans' relatives joined The Queen, The Duke of Edinburgh, The Prince of Wales and The Duchess of Cornwall to remember the 55,573 RAF crew who lost their lives. The Queen pulled a rope to unveil the centrepiece of the memorial, a 9ft bronze sculpture depicting a seven-man bomber crew returning from a mission. The Last Post was sounded and there was also a flypast by five RAF GR4 Tornado bomber aircraft crewed by the RAF, and another by the RAF's last flying Lancaster Bomber, which dropped poppies over the park as a message of remembrance for those who died. The Bomber Command Memorial has been criticized in Germany, where many see the devastating attacks as criminal. But there is growing acceptance of Britain's desire to honor its dead. And Germany has donated a £25,000 yew tree for the memorial site. The tree, which will take pride of place in a garden of remembrance next to the monument in Green Park, will be a symbol of reconciliation as well as recognising the sacrifice made by the 55,573 airmen who died to help free Europe, including Germany, from Nazi tyranny. It was originally planted in Potsdam, near Berlin, to commemorate the meeting in 1945 between Stalin, Churchill and Truman at which Germany's future was decided. Jim Dooley, chairman of the memorial committee, said when the move was announced two years ago: "This is a stunning gesture by the German people, and one for which we are hugely grateful." Concerns in the city of Dresden have been assuaged by an inscription commemorating all lives lost during the raids. Heike Grossmann, spokeswoman for the mayor of Dresden, Helma Orosz, said: "We are close friends with people in Britain, we are twinned with Coventry, and at first we were surprised that the memorial was being constructed. Our mayor raised concerns when she happened to be at an exhibition in London and met London mayor Boris Johnson. The inscription is a further gesture of reconciliation between Britain and Germany." Marshal of the Royal Air Force HRH The Prince of Wales looks at Australian Bomber Command Veteran Phillip Smith's historic photo at the memorial dedication. Dudley Hannaford, 88, who came from Sydney, Australia for the service, told how he served as a wireless operator on Lancaster bombers flying out of RAF Waddington in Lincolnshire. "I had 18 operations over Germany and I was shot down on the 18th," he said. "I joined up with the pilot and we tried to evade capture, which we did for 16 days, but we ran out of food and had to give ourselves up. It was quite near the end of the war anyway, and I was in a prisoner of war camp near Munich when I was released and repatriated." He said today's occasion was "absolutely wonderful. It makes me think of release and victory. I only played a very small part in that, but it is something to be very thankful for." Other veterans came from Canada and New Zealand.